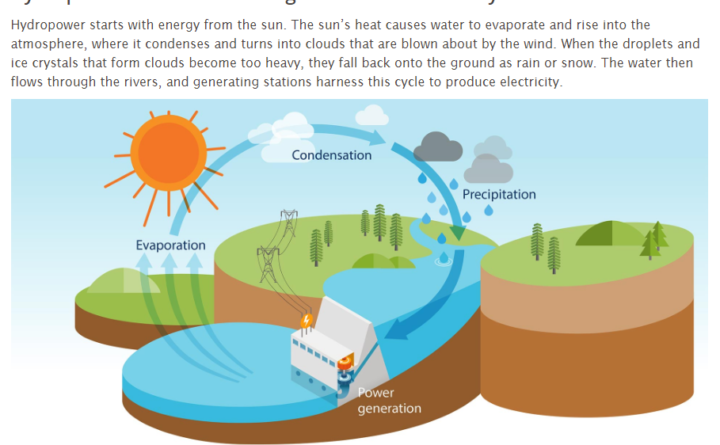 How hydropower is generated from water, moves through a dam and is transmitted through electric power lines. The New England Clean Energy Connect would run from the Canadian border to Lewiston. It would be a high voltage, direct current transmission line that would run 145 miles from Beattie Township, a small community on the Canadian border, to Lewiston, where it would connect to the New England electric grid. The line is expected to cost $950 million, which would be paid for by Massachusetts. Most of the line would run overhead on 100-foot towers. It would, however, run under the Kennebec River between Moxie Gore and West Forks, a concession Central Maine Power made to residents worried about the impact a line over the river would have on the area’s scenery and tourism industry. The line would then run overhead to Lewiston, where CMP would build a $250 million conversion station. Roughly 50 miles of the proposed line, from the Canadian border to just south of the Kennebec River, would require clearing a 150-foot wide corridor. The rest of the line would run along an already established transmission corridor, although it would need to be widened by another 75 to 85 feet to accommodate the new line. If Central Maine Power wins all necessary permits, it anticipates construction of the line would begin sometime around the end of 2019, with a targeted completion date of late 2022. CMP has won endorsements for its line from most of the towns along the line, but it has so far failed to win support from environmental groups. Most of the towns along the line have expressed support for the project, with the exception of Caratunk, New Sharon and West Forks. While Caratunk initially endorsed the line, it rescinded its support and now opposes the project. The Sportsman’s Alliance of Maine also initially supported the construction of the line but withdrew its support after members expressed opposition. Some environmental groups studying the proposal have yet to weigh in, including the Acadia Center and the Conservation Law Foundation. Both groups declined to comment on their evaluations of the line to the BDN. CMP has said the project would produce $1 billion in benefits to Maine over the first decade, as well as 1,700 jobs and increased broadband access. Business groups, such as the Maine Chamber of Commerce and the Industrial Energy Consumers Group, have endorsed the project. CMP proposed the line in response to a Massachusetts law. In August 2016, Massachusetts Gov. Charlie Baker signed a law requiring the state’s electric utilities to request bids for projects that would bring large amounts of clean energy to the state, which currently relies on natural gas for nearly 70 percent of its electricity. The utilities received 53 project proposals. The CMP proposal was not Massachusetts’ first choice. In January 2018, Massachusetts selected the Northern Pass project, proposed by Eversource, to deliver energy from project partner Hydro-Quebec. The line would have run 192 miles across much of the state. A 60-mile portion of the line would have been buried to protect areas like the White Mountain National Forest. Northern Pass and CMP’s transmission line are similar projects. However, there are some key differences. One is cost: Northern Pass was expected to cost $600 million more than CMP’s line. Another difference is that Northern Pass project sponsor Eversource offered New Hampshire $210 million in funds to help tourism, economic development and habitat restoration projects. In Maine, CMP has offered just $22 million to fund similar initiatives. It has, however, offered to pay $50 million to help low-income ratepayers in Massachusetts. Public Advocate Barry Hobbins has called for a similar package to help low-income ratepayers in Maine. CMP’s offer to Maine is much lower than the package offered to New Hampshire because the Maine project is cheaper and requires less wildlife disruption, according to CMP spokesperson John Carroll. After New Hampshire regulators ruled against the project, Eversource appealed, offering another $300 million in benefits. That appeal was rejected by the New Hampshire regulators, but the New Hampshire Supreme Court eventually agreed to hear the appeal. After the project was rejected by regulators, Massachusetts chose CMP’s line as its replacement. 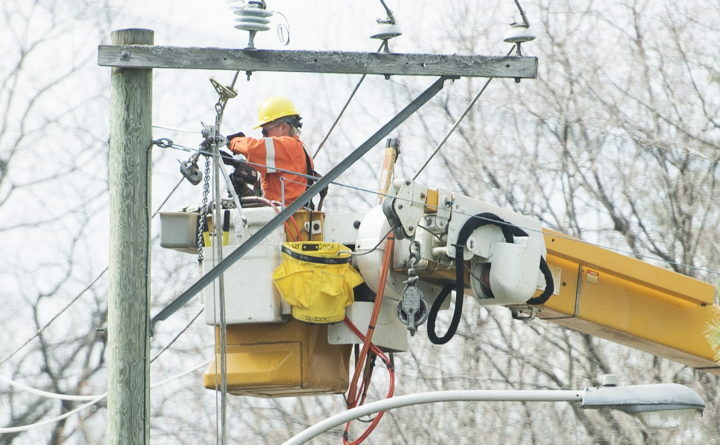 The Maine Public Utilities Commission will soon have to decide whether to approve the line. Central Maine Power applied for a Certificate of Public Convenience and Necessity from the Maine Public Utilities Commission. The commission consists of three commissioners, one of whom serves as chair. The commission is expected to vote on whether to grant the certificate in late March. CMP will need to convince two of the three commissioners that the line will serve a “public need” to secure the certificate. All three commissioners were appointed by former Gov. Paul LePage, who favors the line. The commission’s current chair, Mark Vannoy, ends his term in March. It will be up to Gov. Janet Mills to decide whether to nominate Vannoy to another term or nominate a successor. Central Maine Power also needs permits from the Maine Department of Environmental Protection and the Land Use Planning Committee to proceed with the project, as well as federal permits. Hydro-Quebec is one of the largest producers of hydroelectricity in the world. Hydro-Quebec owns 63 hydroelectric generating stations, with another scheduled to come online soon. Hydro-Quebec is an independent company owned by the government of Quebec, a setup referred to as a “crown corporation” in Canada. Hydro-Quebec provides electricity for its home province, but it also exports electricity to neighboring provinces and states. The utility has a financial incentive to increase exports: In 2017, Hydro-Quebec’s exports comprised 17 percent of its total electricity sales but accounted for 27 percent of its net income. There is some debate about the carbon reduction benefits of hydroelectricity. Hydroelectricity is produced when moving water spins turbines, which generate electricity. To produce hydroelectricity on a large scale, hydro companies build dams and reservoirs that allow for water storage and control of water flow through turbines. Since hydroelectricity does not require the burning of fossil fuels, it is usually considered clean, renewable energy. But dams and reservoirs have environmental consequences. Constructing them often requires altering the flow of rivers and flooding large areas. This can kill trees and other vegetation that remove carbon from the atmosphere. When that plant matter breaks down underwater, carbon is released. Reservoirs also convert some of that carbon into methane, which research has shown is worse for the environment than carbon dioxide. Hydro-Quebec has sponsored research into how its reservoirs contribute to climate change, and the results are expected later this year.